If I could go back and tell my freshman year self one thing, I would say, “You were not meant to do this alone.” I walked through my first two years of college by myself. I sup­pressed hard and dif­ficult things in the deepest places of my heart and didn’t let anyone in. I dug deep wrenches between friends, family, and myself. 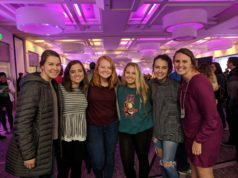 Even when one of the most trau­matic events of my life hap­pened sophomore year, I ran away from people and refused to let others carry my burdens even when they wanted to. I clung to the lie that this whole college thing could be done through my own strength, intel­li­gence, and desire to per­severe. Right now asking for help looks like this: Every morning I drag myself out of bed and pray on my knees. Asking for help means sucking up my pride and walking into Brock’s office each week to seek wise counsel, ask and be asked hard ques­tions, and allow someone to pray over me. It means going to my friends and allowing them to carry my burdens and receive love from them in new and familiar ways. Help only comes from asking. Help cannot come from within — it forces us to look else­where. To my fellow stu­dents: Do not col­lapse under the belief that you can do this thing called life alone. Do not believe the lie that you don’t need anyone. Accept love from others and ask for help. You were not meant to do this alone; you were made for com­munity.